Since my wife and I were in Kawasaki to celebrate her birthday with her twin, I figured it was the perfect opportunity to finally make the pilgrimage to the heart of Tokyo and experience Popeye Beer Club for myself. The trip from Kawasaki station to Tokyo’s Sumida-ku station in Ryogoku would take about an hour each way on one of Tokyo’s infamous commuter trains but what the heck, how often does a guy get to go to a world famous beer bar? A little history on Popeye’s (pictured above) and the Japanese craft beer industry. Waaaaay back in 1994, when the Japanese government lowered the legal limit for a brewing license from 530,000 to about 16,000 gallons a year the Japanese craft beer movement was born. A small restaurant owner, Tatsuo Aoki, saw the writing on the wall and wasted no time in learning all he could about craft beer, soon he began offering samples to customers at his small Western-style “snack pub” called Popeye Beer Cub. The Japanese are by nature an openly curious people, especially when it comes to food or drink, and demand for the new craft beer styles surged. Aoki soon had to remodel to accommodate more customers and expand the number of taps to keep pace with Japan’s growing craft beer industry. Forward thinking, and enthusiasm for craft beer, has made Popeye Beer Club Tokyo’s best pub for Japanese craft beer and “clubhouse” for local and visiting beer geeks. Cold rain fell as our motley little crew gathered under umbrellas at the Tokyo Edo Museum. The group consisted of me, my wife, Bonne, her sisters Mayumi and Rieme, and Rieme’s husband Kaname. Later we expected to be joined by local beer writer and official expert on Japanese craft beer, Bryan Harrell of Celebrator magazine and Bento.com at Popeye’s. We planned to meet Bryan at 8 p.m. but we’d opted to arrive in Ryogoku early (4 p.m.) to avoid the crush of rush hour crowds on the trains. To fill the time we visited the Tokyo Edo Museum and planned to sample the fare at a small brewpub in the area called Beer Station. I’ve always found Japanese addresses confusing and this situation was no different, but it wasn’t just me this time. None of us could find Beer Station’s address, 1-3-20 Yokozuma. It was actually kind of funny watching locals flail around just as lost as I would have been. We wandered around for quite some time before finally breaking down and asking a security guard at the Sumo Stadium if he knew where it was. He knew all right, the brewpub had closed over a year ago. It began to rain harder as that information sank into our collective consciousness. There was nothing else to do, we turned and made our way to Popeye’s 2 hours early. For a pub with a worldwide reputation, it wasn’t the flashiest place I’d ever seen. In fact, if I wasn’t looking for it, I probably would have strolled right on by. Walking in I immediately felt at home, the place was reminiscent of a good western style pub. 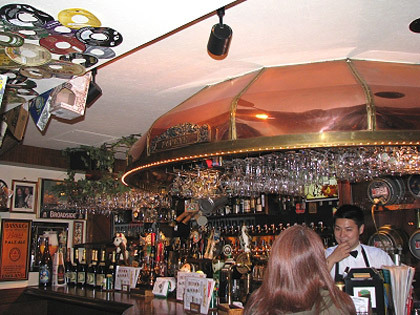 Breweriana, a lot of which came from Oregon, filled the walls and dangled from the ceiling. The good thing about arriving early was we had our choice of tables. We chose a corner spot with a view of the bar and the deck. When we took our seats we were immediately presented with beer lists and hot towels. The towel was a delicious welcome, coming out of the cold, wet weather, and a great start for what would be a memorable evening. Our servers Ayano Ishibashi and Kyohei Makajima, were very knowledgeable about craft beer, and very attentive to our needs. I looked down at the list and immediately knew how the Japanese must feel when they come to one of our high end craft beer pubs. Ayano and Kyohei were about to earn their wages. Most of the breweries weren’t familiar, and quite a few I couldn’t even pronounce. (Especially after a few pints) Although the website and everything else at Popeye’s screamed 40 beers on tap that wasn’t the case when we arrived…they’d recently expanded their offerings to 70 beers on tap. Our servers were delighted to make recommendations and tell us the stories behind the beers as we studied the menus. There were several American craft beers on the list; Full Sail, Rogue, Sierra Nevada, Fish, and Speakeasy. I also saw tap handles for Great Divide and Mendocino behind the bar. Lindeman’s and several other European brews were there too. Rogue was the best represented with 6 styles. Not too surprising when you consider Rogue was the first American microbrewery to enter Japan. They began shipping beer to Japan the same year the beer laws changed (1994). Phred Kaufman of Mugishutei (Beer Joint) was instrumental in the successful introduction of Rogue Ales, and the Rogue mystique to Japanese craft beer consumers. It was a match made in beervana, the Japanese appreciate craftsmanship, and they’re willing to pay for it. Rogue punched all the right buttons from labeling their bottles in Japanese Katakana, (the first American craft beer to do so) to choosing styles that matched the Japanese palate Phred Kaufman knew so well. Interesting, but I didn’t come to Popeye’s to drink American craft beer. I recommended several familiar beers to the group and concentrated on the Japanese offerings. Last time I’d really immersed myself in the Japanese craft beer culture was when I attended the Great Japan Beer Festival in 2001. That was a turbulent time for the Japanese craft beer industry, not unlike the shakeouts experienced in the American craft brew revolution, where many microbreweries go under due to poor quality, business sense, or just plain bad luck. People in the Japanese craft beer community simply refer to the beginning of the decade as “The Crash”. I hadn’t found a lot to get excited about at that 2001 event. Now I was looking forward to evaluating the evolution of Japanese Craft beer since. What I found was a craft beer culture that has grown and matured, carving out a flavor niche that is distinctively Japanese. The Japanese craft beers I sampled weren’t clones of those from other countries. Sure, they share the names of a wide array of styles we’re all familiar with in American craft beer, but you’ll be hard put to find the bold slap-in-the-face taste common to American microbrews. Whereas big hop taste and high alcohol identify the Northwest beer culture, subtlety and balance seems to be the goal for Japanese microbrewers. I like to savor the interplay of multiple flavors and actually prefer a well balanced beer to many of the over-the-top microbrews. The bar began to fill up as we received our food and beer. If I closed my eye’s it could be a pub anywhere in the world. (Except eavesdropping on conversations around me was virtually impossible) I watched a mixture of Japanese nationals and foreigners fill the tables. They all had that familiar universal smile I see when people have come to talk about beer. Riemi, who is very bold in her tastes, selected a Rogue Imperial Stout, a big beer by anyone’s standards. “Whoa!” was about all she could get out initially. I offered to get her a new beer and finish it myself (can’t waste good beer! ), but she declined and took another, smaller, sip and smiled “I like it.” Mayumi started with the Hidatakayama Weizen which she really liked and I found very nice as well. She seemed to lean towards the softer weizens, porters, and bocks thru the evening. Kaname was more mainstream in his taste; he tried several styles but ended up going back to pilsner, though he did find a pilsner from Echigo Brewery that he liked much better than the Asahi he usually drinks. Bonne found a new favorite in Swan Lake Golden Ale. I tried a glass. It was the finest golden ale I’ve ever tasted, incredibly clean in taste and clarity; it seemed to glow like liquid sunshine when held up to the light. We’d already gone thru 15 or so beers and as many plates of food when Bryan Harrell arrived at 8 o’clock. I think he was a little distressed he couldn’t lead me thru the beers, introducing each with a pedigree and brief history on the brewery. I apologized and explained why we’d gotten such an early start on the evening (early by Tokyo standards at least.) But I thought I had a few more in me if he had some suggestions. I tried it and found it to be an excellent, well built, stout. We discussed some of the other beers I’d already sampled and the state of the Japanese and American craft beer industry. I told him I was very impressed with the advances I saw in the beers since 2001 and I presented him with a bottle of 2008 Rogue Brewer’s Ale I’d brought over to give him. I figured it would be something special he couldn’t get in Japan. Bryan returned the favor by buying me a bottle of Babakan Catfish Head IIPA (a tongue-in-cheek tribute to Dogfish Head) to take home. I tried a pint and found it very complex and interesting, but using Dogfish Head as a benchmark, it didn’t quite hit the mark. I think I’ll let the bottle age a bit and try it in a year or two, like the Japanese microbrew industry, it’ll only get better with age. •	Tokyo Real Ale and Nippon Craft Beer festivals began here. 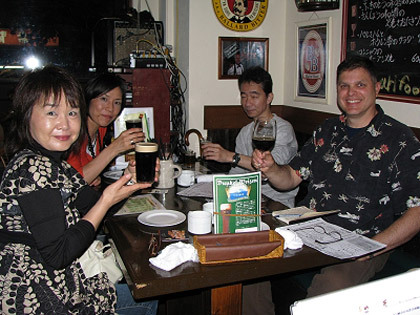 •	Members of the Beer Enjoyment, Education and Research Society (BEERS), an English-speaking beer club in Tokyo, are frequent patrons. 26 beers on tap and a selection of freshly made bar food. It’s on the second story and can be difficult to find, but local shops will help you find it. Baird Beer Tied House, Twenty taps and four hand-pumps are devoted to the largest lineup of Baird Beer available anywhere. 300 varieties of beer from over 50 countries. The largest selection of beer in the orient. For a comprehensive source of information on Japanese beer, bars, food, and restaurants go to www.bento.com. Ironically, Phred Kaufman wrote an article or two for All About Beer magazine when it was a print magazine, and only a couple of years old. Honestly, its great to see such interest in the craft brew scene take off not only in the USA but other unique locations across the world!